She did it again! My Secret Pal has spoiled me yet again! This arrived on Friday and, once again, she has sent a project. She has named them "SP10 Productions"...this one features Rowan Kid Silk Haze in pearl and Knitty's Branching Out pattern. In the midst of all of the things I was attempting to accomplish this weekend, I also cast on this project. (Just what I needed this weekend, another distraction!) 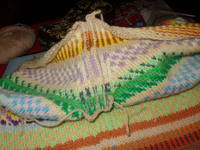 However, after knitting merely 7 rows and not liking the results, it was frogged and set aside. 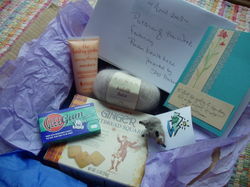 In addition to the project, the parcel contained hand creme, ginger shortbread, Glee gum, and a sheep pin that the Wild & Wonderful Washington Woman (aka SP) made. The gum is great! There is even a gum-making kit that my youngest, Casey (formerly known as KC) wants to get for a "summer break" project. Thank you Pal..you really have me figured out! Okay, okay, someone is bound to ask to see inside the drawers, so here's a peek for all of you. The top drawer is home to skeins, the middle one has balls and the bottom has solid color yarns. 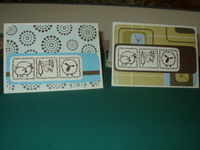 Now, because there are bound to be more questions...I didn't do the stenciling, my mother did. She had this dresser in her guest bedroom. It has been in our family since my brother was born. Back then, this doubled as a changing table (back when changing tables didn't have straps) for him. Thankfully sock knitting has returned to some sort of regularity around here. 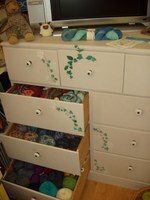 So the drawers have some wiggle room for more sock yarn. 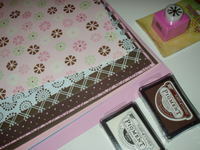 (That and recent card making is cleaning out a drawer on the right...just in case.) 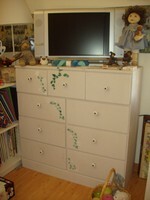 Three "glee-filled" drawers! Thanks for asking Shelby. Since coffee is my other passion, what better place than the Knitters Coffee Swap to combine both of my passions!!! Whole bean or ground? Whole bean goodness. We grind our own...one week's worth at a time. Fully-loaded or decaf? Our "daily" coffee is 50/50. When not purchasing our "regular" stuff, definitely fully-loaded. Regular or flavored? Not a fan of flavored coffees. Favorite coffee ever? Each November we look forward to the release of Caribou's Reindeer Blend (we have ONE bag left!) At a coffee bar, my beverage of choice is a grande non-fat latte (sometimes with a shot of valencia:orange). Favorite treats with your coffee? Cranberry or currant scones. Almond biscotti. Yarn/fiber you love? You'll notice that a minor obsession with sock yarns. Favorite colors? blues, reds, pinks....most any "cool" tones. Allergies? Lavender, bee stings...oh wait, you wouldn't send bees, would you!?! Anything you really love, really don't like, or just need to get off your chest? Maybe. Last week, I couldn't wait for the weekend! Friday came and I had an entire list of things that I wanted to accomplish this weekend. Here it is Sunday and I haven't finished a single thing; though I have made great strides on a lot of things. The cardigan is NOT finished. However, I did manage to sew in the tails that didn't make their way in while I was knitting. Then, I blocked the body. Since I was blocking this large piece, I decided that I could easily block the smaller baby sweater. 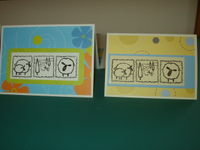 While waiting for it to finish drying, I played with the paper cutters to make more note cards. Then, Saturday night, the first of the steeking started. The neckline was first. It had been a long time since the last steek around here. But it was successful. 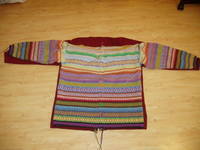 Empowered by the first one, it was time to move on to the sleeves and then the front. I like to use the crocheted method for steeking; it feels more stable and gives me a good surface to work with when it comes time for picking up stitches for the bindings. By this morning, the steeks were finished and awaiting a pair of scissors. 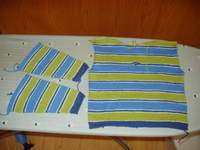 The shoulders were also sewn up. Doesn't it look like great to be (finally) coming together. Unfortunately (for the sweater), the temps rose into the 80's here today. That meant what you see here (from this morning), is exactly the same as what you would see for progress tonight. Far too warm to deal with wool! 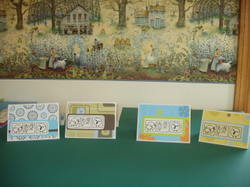 But, more notecards are nearly ready. And, the sock pattern is nearly ready for posting. 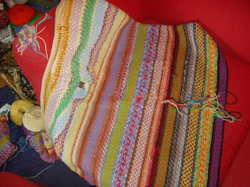 Plus, the baby sweater is blocked and nearly ready. The laundry is nearly finished. I am nearly exhausted from all of this plus my family. Next weekend, NO expectations! Just playing! Promise. Sometimes you have to wonder! A lot of bloggers use their site to "vent" about things...I try not to with mine. However, this week, things keep popping up at work for which I can no longer be silent....I'm talking about catalogs. First, you need to know that we get A LOT of catalogs at the office. 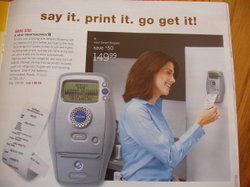 (Even our post office has mentioned to our courier that our office gets the most catalogs in the county!) Once a year, my employer goes through nearly 100 catalogs AT ONE TIME and does an entire year's worth of birthday and holiday shopping. She does not shop for gifts in stores. Hence, we are on a zillion mailing lists. This week, we were hit by a tidal wave of "late spring" catalogs to entice the shopper to make Mother's Day purchases. That's when it happened...a catalog with this arrived. As a society, how lazy have we become? AND, how much money do we have to "throw away"? (Don't make me mention the backyard Big Foot that I also saw!) For those of you who think the list maker is from one of those "high end" or gadget catalogs like Sharper*Image, it wasn't. You can get this handy dandy device at JC*Penney. What's next!?! If only they would come up with a blocking device and a steeking device to do that for us! Pop your sweater into the "Smart Blocker". (Of course, mine would include the "steeking mode".) 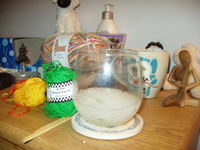 Insert your favorite wool wash (such as Soak), yarn for the bindings, and press start. Return later in the day to find your sweater washed, blocked, steeked, with bindings and photo ready! Now THAT would be a worthwhile device! Note for clarification: I agree that "Smart Shopper" is a device that would come in handy for some elderly and/or impaired individuals. I was trying to express that the item would be frivolous for someone like me since I am neither. I apologize if I offended any who thought this item useful for their situation. For those of you who thought me brave because I was about to cut into my sweater, I have news for you; I can find all kinds of reasons to "wait" to steek. 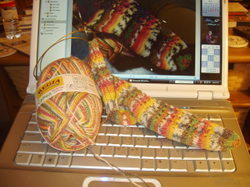 Reason #6) Now the sock is nearly finished. Maybe I should finish the pair AND THEN do the steeking. (Stall Queen.) But isn't it a pretty sock!?! Let's hope that waiting to steek doesn't last as long as it has for the baby sweater. It's still waiting. Did you read about the caffeinated soap. I might be tempted to buy ONE bar just to say that I tried it, but really! It could just be the peppermint infusion blended in that causes the "wake up" effect. In the meantime, for caffeine purists, top caffeine fixes. My pal Ambermoggie is moving and having a "destash" sale. If you live in Europe, here's a chance to get some Socks that Rocks. Plus, she has a MINT Alice Starmore that she is no longer looking to swap for, but looking to sell if you wish to make an offer. I don't know how I missed this R2D2 hat last fall when we discussed the lovely Princess Leia. Look closely to read the inscription on the band. How to Take Detailed Photos of Your Knitting...need I say more...a tutorial and how-to make a light box. 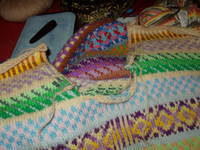 Look, the Fair Isle Cardigan is nearing completion. 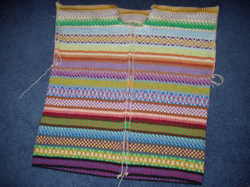 The sleeves have been knit cuff-up (unlike the shoulder down method suggested in the pattern). That way, the sleeves can be long enough for my "orangutan" arms (they go along with my "canoe" feet). 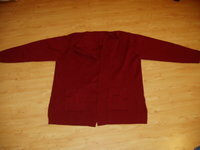 Therefore, the pattern is no help in determining if the sleeves are long enough. In steps my trusty cardigan to be used as a measuring tool. Looks like the sleeves are nearly long enough. Guess I'll do one more repeat of pattern (maybe just on one sleeve to start with) to check the length. Steeking...here I come! In other (non-knitting) news, your request for a Krafty1 Etsy account are in the process. Tonight, Panda and I picked up a few more supplies. We should have the "shop" stocked on Saturday. Thanks for all of your kind comments. If there are color schemes you think should be in there, feel free to chime in with your suggestions. There are some weekends that are all about regenerating. This was one of them. My Cousin came for a visit. 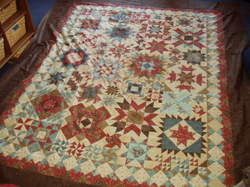 She lives an hour away and, years ago, we used to meet once a month at a quilt shop that was halfway between our homes for their "block of the month". Since her kids are now grown, at the last minute we changed our "date" to a "sleepover". In doing so, our "twist" of schedules could include a "twist of lime". Mmmmmm. Margaritas all around. One for me. One for Isobel's graduation. One for Robin who was with us in spirit. One for my SP because she had a rough week. If there were others who didn't get their "honorary" margarita let me know and we'll take care of that next time. We did accomplish a bit of knitting. I just can't tell you about it just yet. What I can say is that we were true "professionals" and started the evening with frogging ( a preemptive effort) and ended it with knitting. Today I got word from my spoilee that she received her parcel. Unfortunately, I can't share anything about her parcel here. However, I can share the one I sent to Robin. It seems that chickens seem to be on a lot of people's minds. 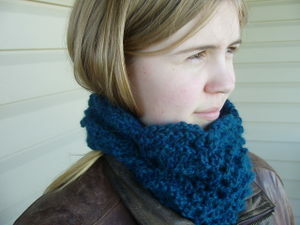 The pattern is from Knit 2 Together and the yarn is from Misti Alpaca. I love the color! It'll match my new socks...once they're made. While we were in Europe last year, we saw so many women wearing scarves and neckwarmers. We purchased some for ourselves and quickly learned how nice it was to have the extra warmth at our necks...especially along the waterfront on a breezy day! I guess I'll have to go for a walk along the lakefront this weekend to give it a test run.